Sarah Marjorie Hoffman (born May 23, 1980) is a Canadian politician who is serving as the 10th deputy premier of Alberta, and minister of Health in the cabinet of Rachel Notley. Hoffman was previously a member of the Edmonton Public School Board, where she served from 2010 to 2015 and from 2012 onward as chair. Prior to her service on the school board, she was the research director of the Alberta Legislature New Democrat caucus. After stepping down from the School Board, she was elected in the Alberta general election, 2015 to the Legislative Assembly of Alberta representing the electoral district of Edmonton-Glenora for the Alberta NDP. On May 24, 2015 she was sworn in as minister of Health and minister of Seniors for the province of Alberta. Following a cabinet reshuffle on 2 February 2016, she retained the Health portfolio and became deputy premier, primarily responsible for answering questions to the premier when the premier is not present in the Legislature. Hoffman has worked as both a teacher and researcher for the NDP before becoming involved in politics. She holds a BA and BSc from Concordia University College of Alberta, in religion and math respectively. She also holds a Bachelor of Education and a Master of Education from the University of Alberta, with a specialization in educational policy studies. Hoffman was first elected to the Edmonton School Board in 2010, and was acclaimed for a second term in 2013. She served as the vice-chair of the board from her initial election to 2012, and then as the chair from 2012 to 2015 when she resigned to run for provincial office. Hoffman is also a past member of the Girl Guides of Canada. Hoffman was appointed Minister of Health and Seniors, on May 25, 2015. 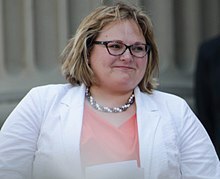 As health minister, Hoffman is responsible for policy, direction, legislation and standards of the health system in Alberta, which is delivered by Alberta Health Services. Affordable housing was part of the NDP's campaign commitment to increase affordable housing for seniors, and was actioned in part through increasing funding for the Alberta Social Housing Corporation. In 2016, Lori Sigurdson was given the seniors portfolio, while Brandy Payne was appointed Associate Minister of Health. Under Hoffman's tenure, health care fees proposed under Jim Prentice and Stephen Mandel were soon reversed, and additional spending in health was initiated. Included in the budget was funding for new and existing medical centres, including the development of the Calgary Cancer Centre and repair of the Royal Alexandra Hospital in Edmonton, though Hoffman was criticized over the reduced level of funding available. Hoffman's ministry also banned menthol tobacco products in September, a move which was designed to decrease the prevalence of smoking among youth. Alberta Health Services discontinued both IVF and IUI services at the Lois Hole hospital for women. Prior to Payne's appointment as associate minister, Hoffman was responsible for her department's response to the fentanyl crisis in Alberta. The street drug killed 213 people in the first 9 months of 2015, and is projected to have increased use in 2016. Hoffman outlined the province's response to the drug, stating that increased quantities of naloxone would be available to counter-act the overdose effects of fentanyl. The province has also engaged in an information campaign directed at youth, to prevent further use of the drug. This campaign primarily targets schools, with posters being placed in prominent areas that outline the harmful effects of using the drug. The response of the provincial and federal governments has been criticized, as access to the antidote remains low despite an increasing number of fentanyl-related deaths. Antidote access is limited in part by a lack of trained nurses, as well as a lack of emergency kits including naloxone available for public use. This problem is particularly pronounced on indigenous reserves, which have less available access to government clinics, and instead rely on a combination of provincial services and federal support to obtain the materials required to treat fentanyl overdoses. As part of the provincial government's response, Hoffman communicated with indigenous chiefs to find ways of increasing antidote supply on reserves in August 2015. ^ "thestar.com - The Star - Canada's largest daily". thestar.com. Retrieved 3 March 2019. ^ "Edmonton Examiner". Edmonton Examiner. Retrieved 3 March 2019. ^ Staples, David; September 5, Edmonton Journal Updated:; 2015 (18 January 2010). "Story of the Oilers: Hanging out, hands in pockets, shirts not tucked in, goals against - Edmonton Journal". edmontonjournal.com. Retrieved 3 March 2019. ^ "Rachel Notley adds six new ministers to her cabinet, three from Edmonton and three from Calgary". Edmonton Journal. 2 February 2016. Retrieved 21 February 2016. ^ "Honourable Sarah Hoffman (ND)". Legislative Assembly of Alberta. Government of Alberta. Retrieved 24 February 2016. ^ "Official Results". 2013 Edmonton General Election. Retrieved 24 February 2016. ^ "Rachel Notley names historic Alberta NDP cabinet". Beacon Energy News. May 25, 2015. Retrieved 26 February 2016. ^ Wood, James (February 3, 2016). "Province plans major push on affordable housing". Calgary Sun. Retrieved 26 February 2016. ^ Tucker, Erika (October 27, 2015). "Alberta budget: Calgary cancer centre delayed, Edmonton hospital funding falls short". Global News. Retrieved 26 February 2016. ^ Theobald, Claire (May 31, 2015). "Health Minister Sarah Hoffman announces the province will ban menthol tobacco products starting September 30". Edmonton Sun. Retrieved 26 February 2016. ^ HENTON, Darcy (January 22, 2016). "Alberta ministers bring fentanyl to the fore in high-level talks". Calgary Sun. Retrieved 1 March 2016. ^ "Street drug fentanyl called Alberta's leading public health problem". CBC News. Dec 8, 2015. Retrieved 1 March 2016. ^ a b GIOVANNETTI, Justin. "Alberta reserves struggle to access fentanyl antidote". The Globe and Mail (Feb. 29, 2016). Retrieved 1 March 2016. ^ Bennett, Dean; March 14, The Canadian Press Updated:; 2017 (14 March 2017). "Health Minister Sarah Hoffman apologizes for 'sewer rats' remark - Calgary Herald". calgaryherald.com. Retrieved 3 March 2019. This page was last edited on 19 April 2019, at 18:04 (UTC).